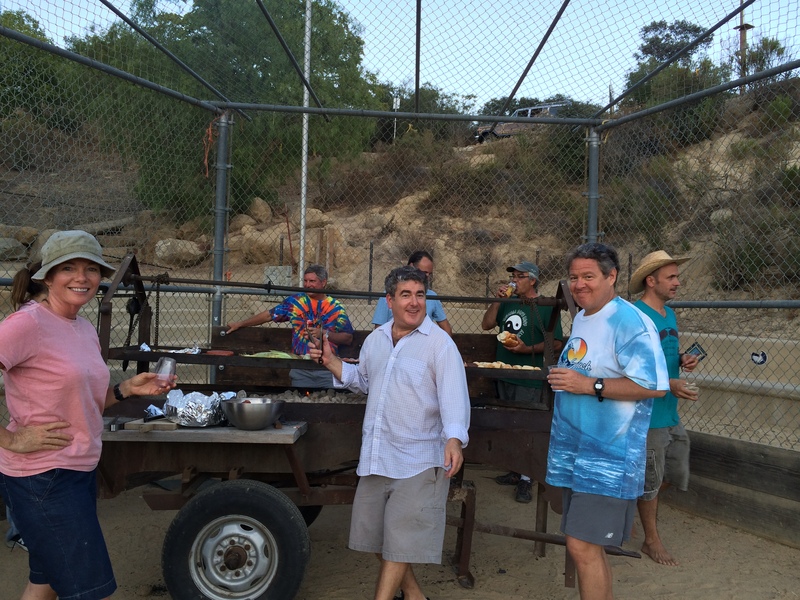 It was to take place on the baseball field on a Saturday in August, there would be a Santa Maria-style grill to cook on, games for the kids, campfire singalongs and so forth. 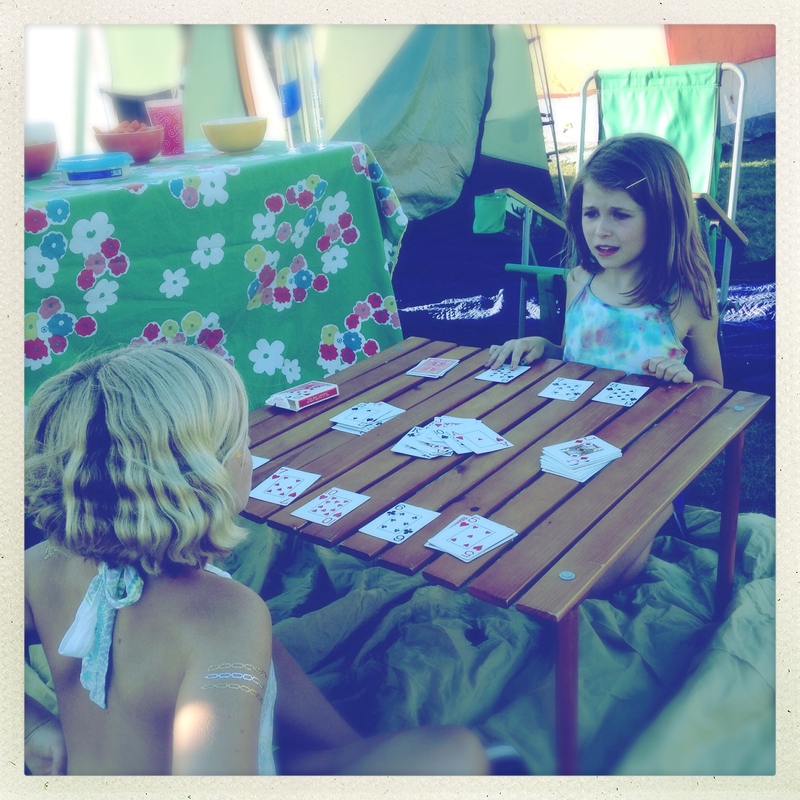 It sounded interesting, but probably wasn’t our style of thing — I’m a reluctant camper, I find the packing up, unloading, setting up camp, breaking down, packing back up and unloading again a laborious process, especially for a single night a couple miles from home. But then I began to get emails from some of my favorite friends: “Are you going to the Fiddle & Griddle campout?” and “We’ll go if you go!” I brought the idea up to my wife, who thought it sounded fun. So I hopped online and reserved a site. Among our group of friends, I was tasked with cooking the main food for grownups, while gal pal Annie would handle kid food. “You’re gonna have campers seagulling your grill mañana,” my pal Nat warned. I opted for Mexican food — I could grill big flaps of meat, it would be easy to feed lots of people. The morning of the event, I made 40 or so corn tortillas, two different salsas, a batch of albacore and shrimp ceviche and some stuffed New Mexico chiles. And I set the meat to various marinades: tri tip with a dried chile rub, skirt steak with garlic, pimenton and olive oil, bone-in New York strip with simple salt & pepper, chicken with garlic and orange juice, and Sea of Cortez halibut with lime, mayo and chile powder. We had our complicated 10-man tent (we call it the “Taj Mahal”) set up by 4:30 and were well into the beer and wine when friends Derek and Cristina showed up with two bottles of Patrón and a whole lot of limes. There would be no seagulling from random campers as prophesized by Nat, however, as there was plenty of food — the Santa Maria grill was full at all times, as was the small side grill friend Vince brought. Contributing to our meal was Don Schneider with several long-marinated pork shoulders, and the Shores with Korean short ribs. I manned my cutting station and began offering up various kinds of tacos. The campout’s instructions had suggested we bring our acoustic instruments to take part in a jam session. There was not a fiddle to be seen (“Were you bothered by the fact that there were neither fiddles nor griddles?” a question on a follow-up survey would ask the following day). And the dearth of guitars led me to a sudden disturbing realization — I would be the evening’s entertainment. 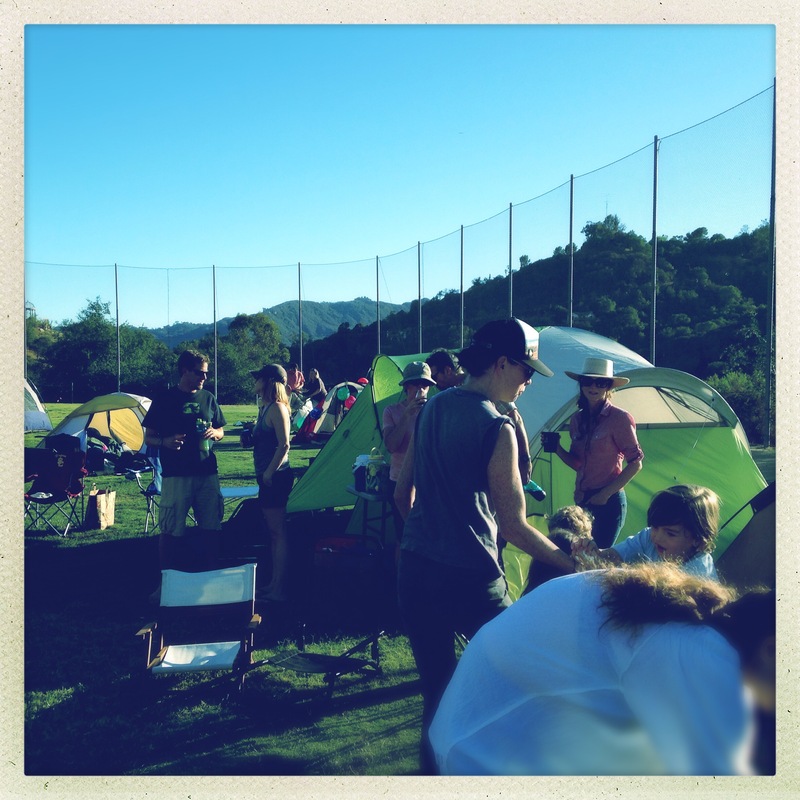 The sun had long set, the tacos were served with a mountain of meat leftover, the kids — largely ignoring the schedule of fun camp games — were roaming in a “Lord of the Flies”-like pack, and I pulled out my guitar. Someone refilled my margarita glass to go with the wine I had now switched over to, and that’s pretty much the last thing I remember. The marine layer broke up slowly in the morning, the sun revealing itself first in furtive rays and then finally sweeping across the mountain and burning off the last of the gray. And even though I was only a couple miles from home, I was reminded that I do live in a pretty special place — a place where people from other places would travel long and far to camp in. A fine cowboy breakfast of flapjacks, bacon and coffee hit just the right spot, followed by the more intrepid among us finishing off a few beers that were still on ice. We threatened the organizers with an “Occupy Topanga” movement — we weren’t leaving until we heard a fiddle. In the end we gave in, packed up and ambled home some 18 hours after we’d arrived, tired and a bit hungover but filled up with local friendship and fun — the reluctant camper a very happy camper indeed. 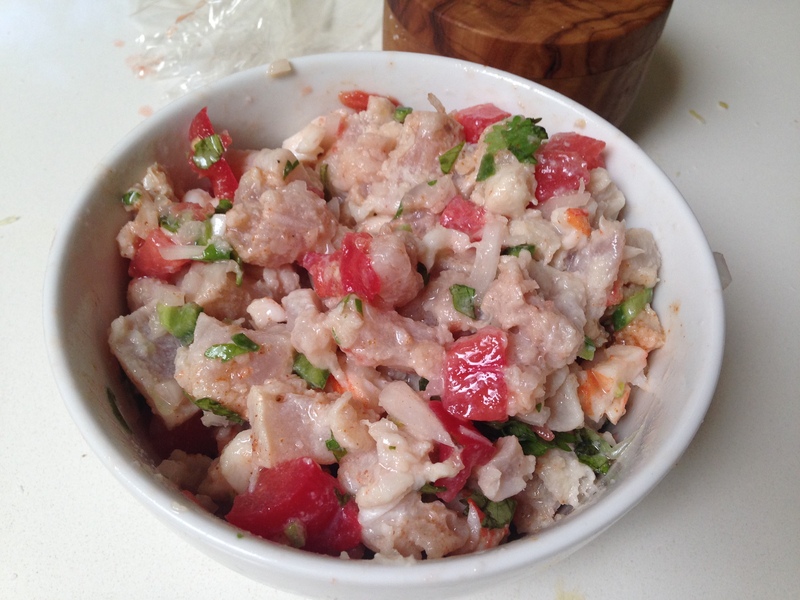 Cut the albacore into small chunks, being sure to remove any small bones. Place in a large bowl. Squeeze juice of 2 limes over the fish, toss and cover with plastic wrap. Place in the fridge for three to four hours, stirring occasionally. Cook the shrimp in boiling water until pink and firm. Remove and cool. Remove shells, if applicable, and chop shrimp into small chunks. Drain off lime juice from albacore. Add shrimp, onion, jalapeño, tomato, cilantro and Tapatio. Squeeze juice from remaining limes and toss. Season to taste with salt and pepper. Return to the fridge until ready to serve in a dish with tortilla chips for scooping. Um. That sounds awesome! 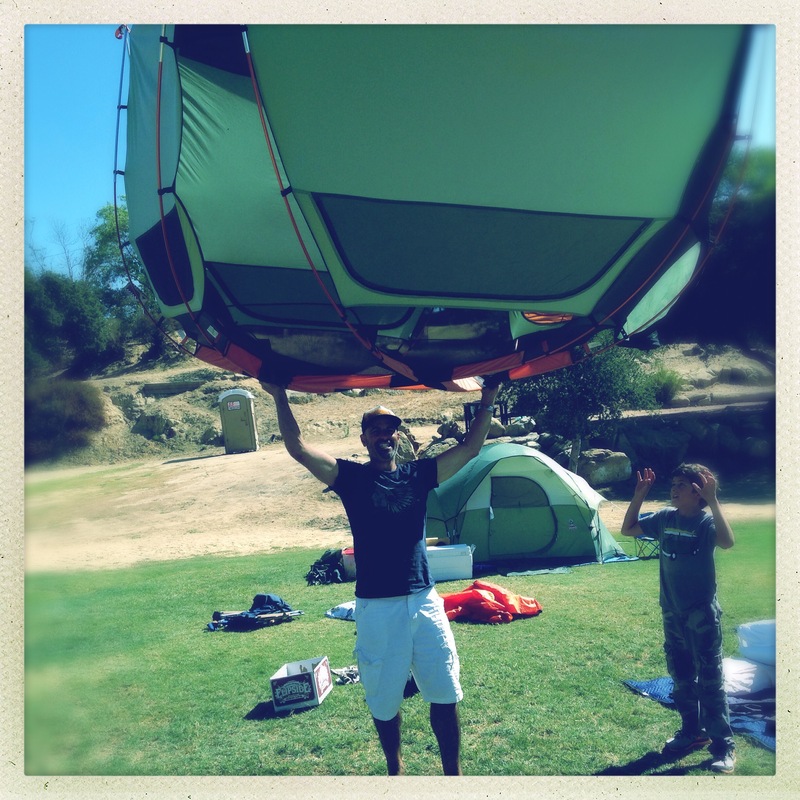 While I totally appreciate the annoying factor of packing and unpacking things up (my least favorite part of any camping, hiking, river trip) I would totally have been into this. And I would have been stoked about the lack of fiddles. Your version (tacos, tequila and some guitar music) sounds WAY better. Tacos, tequilas and guitar… just wish I was more adept at mariachi, and could’ve made it a real fiesta. Maybe next year instead of “Fiddle & Griddle” it should be “Vihuela y Tequila”. Well, I guess you could do it with chicken although you wouldn’t want to eat the chicken raw, so you’d have to cook it first. It’s good with any fresh ocean fish or shellfish — tuna, halibut, mackerel, shrimp, scallop. You must have some good ocean fish in India, yes?